New to church - Trinity Baptist Church, Thomaston Ga. Leading people to faith in Christ and equipping them to serve. 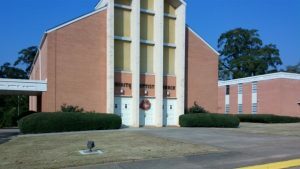 Trinity is a small city, downtown church in Thomaston, Ga., that began in 1957. It has a great heritage, and like most churches today, is working hard to learn to meet our rapidly changing culture, with the unchanging gospel of Jesus Christ, in a purposeful and relevant way. Trinity’s mission statement sums up our intent. “Leading people to faith in Christ”. The church is a missions giving, missions going body of Christ. Now, Trinity believes we have a renewed commandment from God to reach our own neighborhood, which is working out in some wonderful ways. “And equipping them“. The church body at Trinity is a strong, Bible believing church. We want to train and build up those who are following Christ. “To serve“. People need places to minister, or help to begin their own ministries. Regardless, every child of God is born to serve in the name of Christ, and we want that to happen. what are the beliefs that bind together God’s people around the world? Are you Buddhist, Muslim, Mormon, Christian, Atheist? People follow a religion for the same reason. We are all trying to solve our sin problem and be good enough to reach paradise one day. In your belief, how is sin forgiven? We all sin. We live for ourselves, instead of for God who made us. We ignore and break his commands. We are often selfish and hurt other people. All this sin brings guilt, which leads to judgment from God. In your religion, how can guilt be taken away? Even if we could live perfectly for the rest of our lives, which is impossible, how can we erase the sin we have already committed in the past? There is a way to be forgiven. God is holy and perfect, so he must punish sin. However, he is also loving, so he made a way to pay for sin and satisfy righteousness. Jesus, his own Son, substituted himself for man’s judgment. That is why Jesus came into this world. He perfectly kept God’s law, which we have failed to do. He willingly died upon the cross, bearing the judgment of God for our debt. Then he rose again from the dead, so we also could rise again and have eternal life. I believe in Christ. I believe in God’s love. I have turned from my old life, and I have trusted in Jesus to forgive and save me. Now I follow the one who has paid for my forgiveness, and I stand before the heavenly Father justified and righteous. “But now the righteousness of God apart from the law is revealed, being witnessed by the Law and the Prophets, even the righteousness of God, through faith in Jesus Christ, to all and on all who believe. For there is no difference; for all have sinned and fall short of the glory of God, being justified freely by His grace through the redemption that is in Christ Jesus.” Romans 3:21-26. …that Jesus died for sin and rose again? Will you humble yourself before him and ask him to forgive you? Will you follow him, becoming his disciple, and let him begin changing your life? Bob Wilson is the pastor at Trinity. He came in 2007 with his wife, Glenna, and their four children. He loves the people in Trinity and the community he has come to call home. Bob is passionate about preaching and growing God’s kingdom. He is a gardener, a wanna-be painter, and teaches the martial art of taekwondo. Justin Thomas has been associate pastor of worship since 2015. He is married to Kathy, and they have four children. Justin’s passion is music. He sings with the Sons of Jubal, and plays piano and guitar. Joan German is the administrative assistant at Trinity, having joined the staff in 2016. She has a great sense of organization, a “can do” attitude, and a wonderful group of grandchildren.